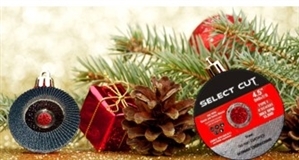 Back by popular demand, the Flap Disc and Cut Off Wheel Combo Deal returns for the holiday season…at a new low price! 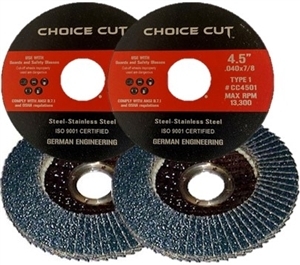 The Combo Deal features Premier Grind 4.5" zirconia flap discs (German Made) and SELECT CUT 4.5” cut off wheels. Most of you know the drill…Use the COMMENTS section to let us know types and grits for the flap discs. If you leave this blank, we'll send T29 /10 - 40 Grit, 10 - 60 Grit and 5 - 80 Grit. ***Roark Supply is a leading provider of abrasives used by fabricators, as well as off-road and custom car enthusiasts. EB's...some assembly may be required. I just placed my order. Thank you! Black Friday and Cyber Monday have come and gone…but our Flap Disc and Cut Off Wheel Combo Deal continues. Is this deal still going on? If so what's the difference in the 27 and 29? The holiday season will be ending soon and so will the Combo Deal. The special will continue thru New Year’s Day. Don’t miss out! …the Flap Disc and Cut Off Wheel Combo Deal, ending tonight at midnight. Thanks for all your support in 2018 and best wishes to you in 2019.